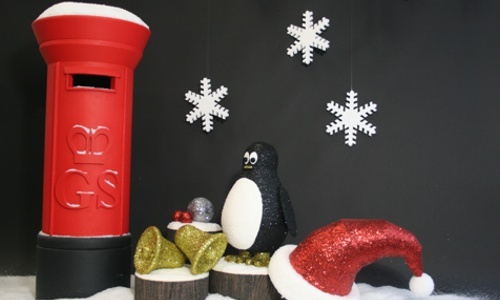 Christmas Display props & decorations from polystyrene for commercial Displays, window display and event theming. Our new VM bauble shelves provide a clever, cost effective way to add decoration to your window or in-store display, whilst promoting your merchandise. Brand new for Christmas 2015: These semi 3d reindeer can come Flat packed, which are great for small storage spaces. They construct in four easy steps, the pieces slot nicely together and hold as one without the aid of any adhesive. 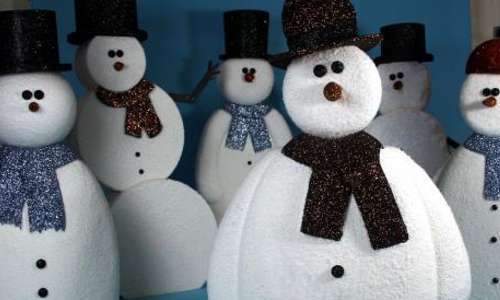 In addition to our popular 2 and 3 ball traditional snowmen, we have added 6 new designs to our range. With new hats, scarves, arms and more! Our traditional style baubles are available form 150mm diameter to a giant 1500mm and larger!. They are all come fitted with secure hanging points. 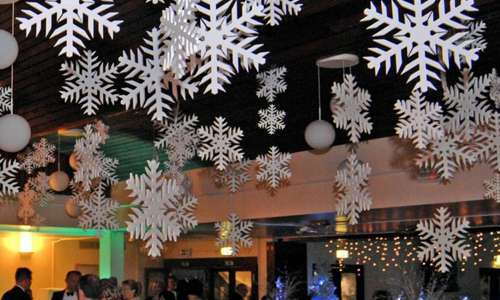 Our snowflakes are made from expanded polystyrene which makes them a very cost effective way to create a Christmas or winter scene. 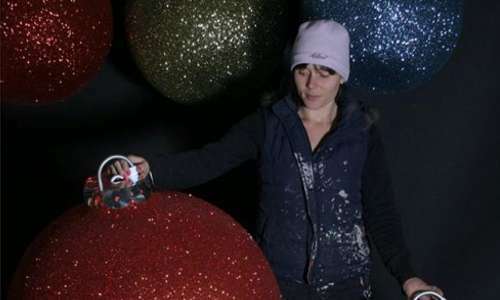 Polystyrene balls, baubles and other shapes are available from 20mm diameter to over 1500mm diameter (5foot) These can be covered with a snow effect, frosted or glittered in a colour of your choice. Brand new this year are our acrylic snowflakes! These small snowflakes are ideal for a wide range of winter displays including jewellers, boutiques and perfume stores. The snowflakes look great hanging with some fairy lights or even a selection of our snowballs! 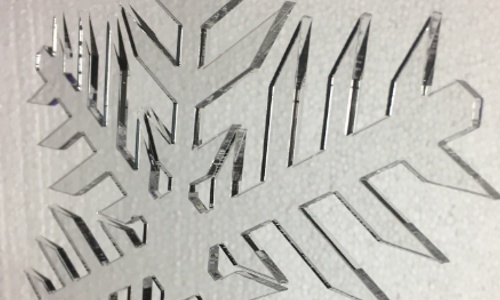 Available in size from 100mm up to 180mm high, the snowflakes will transform any display! As well as our wide range of standard Christmas display products, we also specialise in bespoke Christmas display props, and small runs. We are always working on new ideas for Christmas displays, as well as different ways yo use existing props. Our customisable polystyrene snowmen range from 150mm to over 3 meters in height, adding a cheerful wintry feel to any occasion. Our new VM display shelves provide a clever, cost effective way to add decoration to your window or in-store display, whilst promoting your merchandise. Supplied complete with shelves, and available in a wide choice of colours, these practical dual purpose decorations can be tailored to suit your theme. Polystyrene snowballs are available from 20mm diameter to over 1500mm diameter (5foot). Boxes of loose lay artificial snow are also available. Polystyrene Penguins are available in a selection of sizes. Finished with black glitter, with white frost glitter fronts, they add a cheeky style to any display. Polystyrene snow and ice blocks / bricks for decorative display walls. Icicles up to 2400mm !!. Our range of Polystyrene Christmas tree props are light, quick and easy to install - which makes them ideal for window displays - and event themeing. 2D polystyrene Stars are available plain white, frosted or Glittered in a colour of your choice. All shapes are available with hanging points. 2D polystyrene reindeer are available plain white, frosted or Glittered in a colour of your choice. All shapes are available with hanging points. In addition to our range of Christmas baubles we now offer a range of other 3d Christmas shapes including flattened baubles, bells, trees, tear drops and more. Our high quality plastic baubles are (crystal) clear, and split in half, making them an ideal way to display small items such as pictures, confectionery, jewellery or mobile phones. Loose display snow is great for decorating floor areas in window displays. It works especially well with our snowballs and snowmen! Is is supplied in boxes approx 40cm x 40cm x 40cm.